Without really being aware of it, we breathe in small quantities of toxic particles from the surrounding air 24 hours a day. These are responsible for a great many health problems. Fine particles, defined as particles smaller than 10 micrometres, are the result of man-made or natural combustion processes, friction, evaporation or chemical reactions. Various studies have shown that fine particles are associated with an increased risk of respiratory and cardiovascular health problems. The World Health Organisation has classified fine particles as carcinogenic (especially lung cancer) and therefore dangerous to the public health. Contrary to fine particles, there is almost no public discussion about the smaller classification of particles, ultra-fine particles, even though their impact on public health is even greater than the impact of fine particles. Ultra-fine particles damage the nervous system, including brain cells, and also cause infections in the human body. 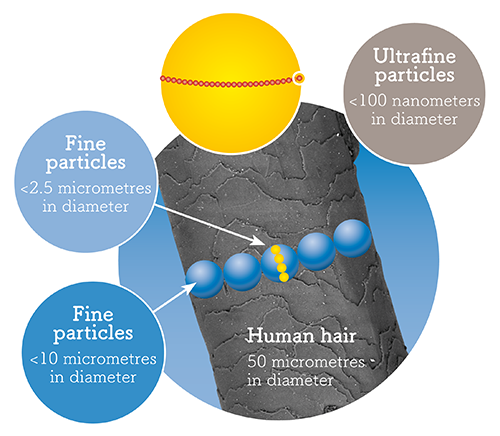 Ultra-fine particles are the fractions of fine particles that are smaller than 0.1 micrometres, in other words 100 nanometres. These particles are released during industrial and consumer-related combustion processes, such as waste incineration and internal combustion engine exhausts. In Europe, this mainly implies the emissions of motorized road vehicles and aeroplanes during taking off and landing.